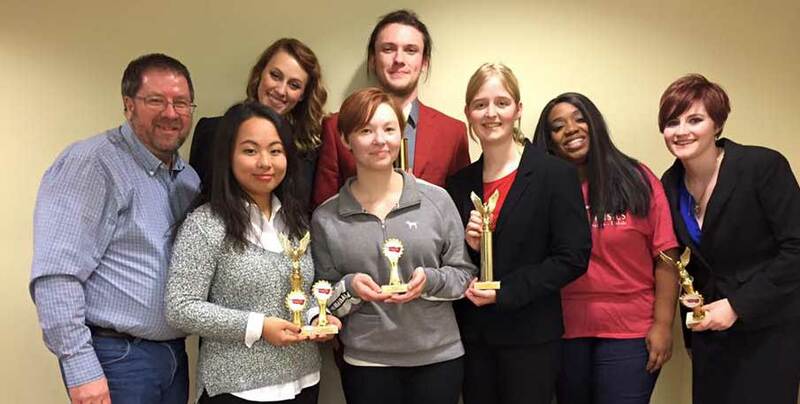 The Webster Forensic and Debate Team opened its spring semester in successful fashion at the Stateline Tournaments hosted by John Brown University and the University of Oklahoma. Heading the list of highlights for the weekend was junior MacLain Naumann qualifying for the elite National Individual Event Tournament. Multiple wins at each tournament enabled MacLain, who is majoring in speech communication studies, to qualify for this national tournament in After-Dinner Speaking and Prose Interpretation. The tournament will be hosted by the University of Florida the first week of April. The team earned a number of other awards throughout the weekend. Angela Meng, a freshman international relations major, was tournament champion in the novice division of International Public Debate Association debate, along with a fifth-place finish in After-Dinner Speaking at the Oklahoma tournament. MacLain and Brooke Villhard, a junior speech communication studies major, were runners up at each tournament in Duo Interpretation. MacLain added a third place finish at the Oklahoma tournament in Dramatic Interpretation. His breadth of success earned him recognition as one of the top three students in the student sweepstakes competition at each tournament. Kirby Weber, a sophomore games design major, earned fourth and seventh place honors in After-Dinner Speaking, along with sixth place in Impromptu Speaking at the Oklahoma tournament. Eva Moentmann, a freshman film production major, won fourth place in Programmed Oral Interpretation at the Oklahoma tournament. Contributing to the team’s weekend was Olivia Potter, a freshman international relations major, who earned a .500 win/loss record in her first debate tournament. The range of individual successes guided the team to fifth place in the overall team competition for the weekend. The team’s next outings are hosting the 18th annual Gorlok Gala Forensic Tournament during the weekend of Jan. 29. It is one of the nation’s largest and most elite invitational tournaments in the country. The team then travels to Salina, Kansas February 4th for the Border Wars Tournaments, hosted by Kansas Wesleyan University and Cameron University.